This update provides users the ability to create their own Homebrew Character Subclasses! 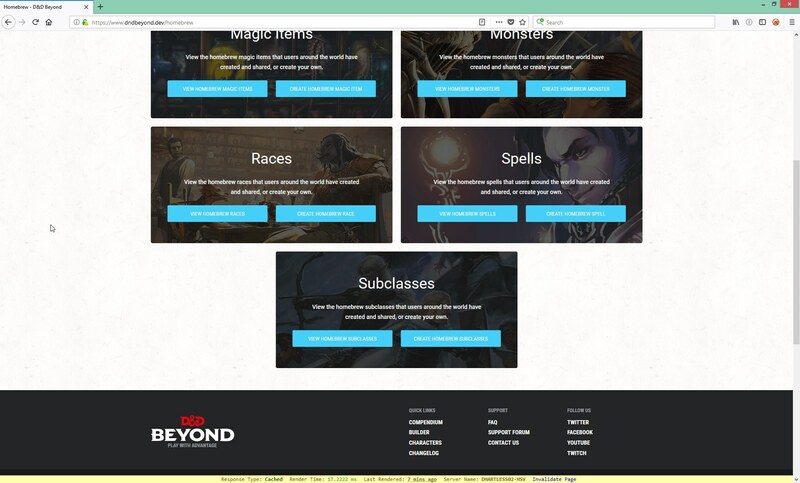 The homebrew subclasses will not only provide textual data in their own listing and details pages, but will also allow users to select subclasses and have their effects applied in the character builder! 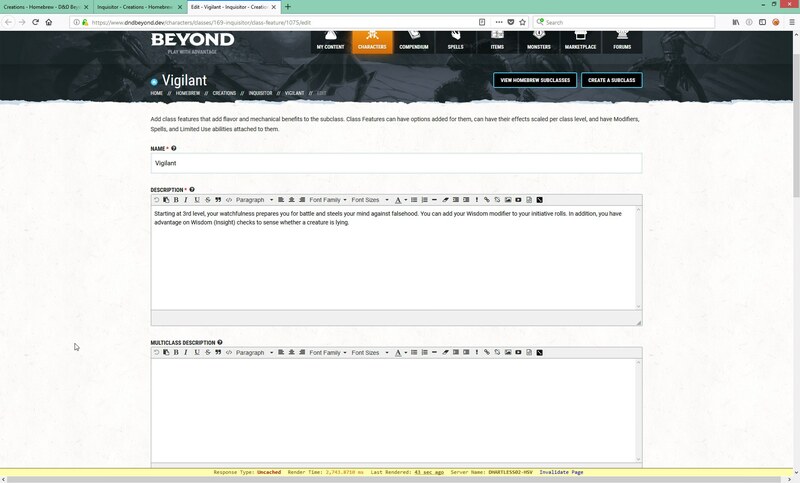 Currently, you can filter by name, author, the base class (Fighter, Rogue, Wizard, etc.) of the subclass, and which spell casting ability score (INT, WIS, etc.) that the subclass may use. Additional filtering may be added in the future, based on feedback. 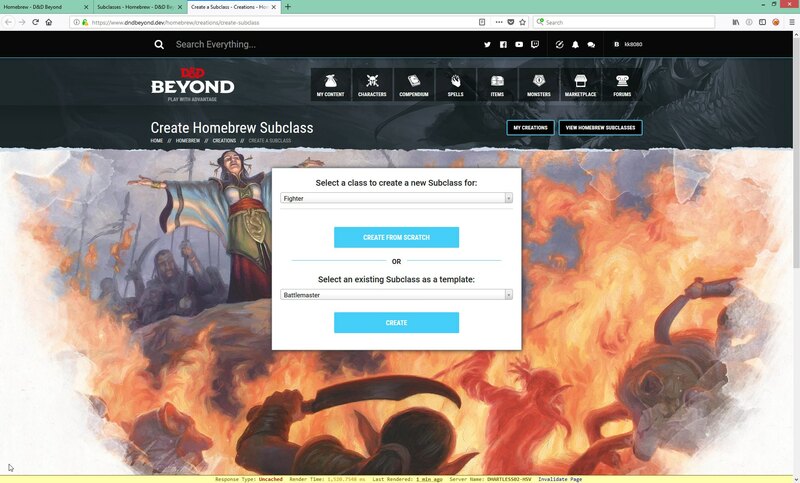 As with other homebrew-able data, you can either create a homebrew subclass from an existing, publicly available subclass to use as a guide, or create one from scratch. You must first select a base class to build your subclass on top of. Once a base class is selected, you can either create a copy of a subclass that you have access to, or create a new subclass from scratch. Let's dive in and create a brand new subclass for Rogue, called the "Inquisitor" (think, church assassin). The starting form is fairly simple, Name, Version, Short Description, Description fields are pretty standard to all our homebrewable data. The next few boxes are interesting, though. Want to make a Barbarian with spellcasting like Arcane Trickster or Eldritch night? Now you can. 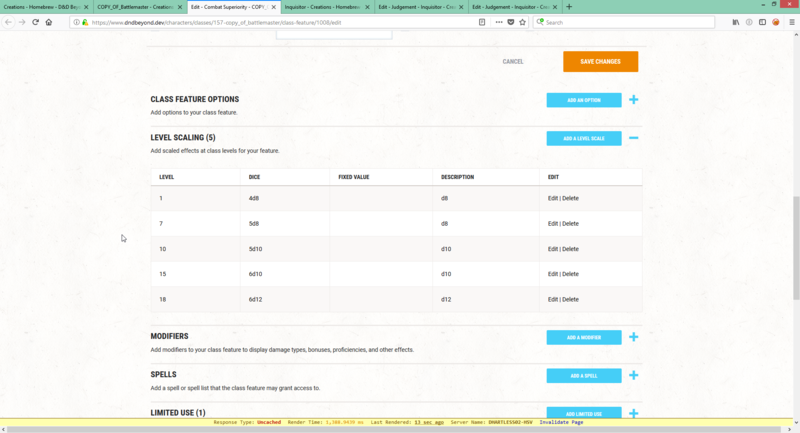 Buy using the spell casting related fields choose the stat for your spell casting modifier, what list of spells the subclass has access to and if the spells are learned (like a Wizard) or known (like a Cleric). You can check out the tooltips on the fields for more specifics. The name and description fields are pretty straight forward, the Multiclass Description field is used if any additional text is needed when multiclassing with this subclass. The actions fields (not currently used in the current character sheet, but will be in the new one), allow us to group data on the new character sheet by Actions / Reactions / Bonus Actions / Other, etc. So, while you won't see any immedaite use of populating these fields, they will be utilized once the new character sheet is launched. Likewise, you can create a class feature called Pact Magic to give your subclass Warlock-type access to spells. Class Features can also have options that characters can choose from (like Maneuvers for a Battlemaster Fighter.) Once your Class Feature is created you can then enter Options. Both Class Features and Class Feature Options can have Modifiers, Spells, and Limited Use applied. Let's give our Inquisitor a Class Feature called Vigilant. We can see the character's base Initiative is +10. 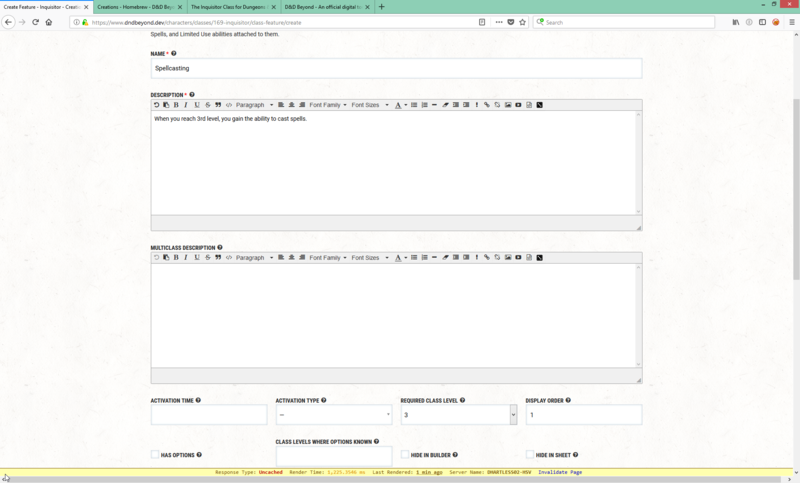 Homebrew Authors will also receive notifications when users comment on their creations. 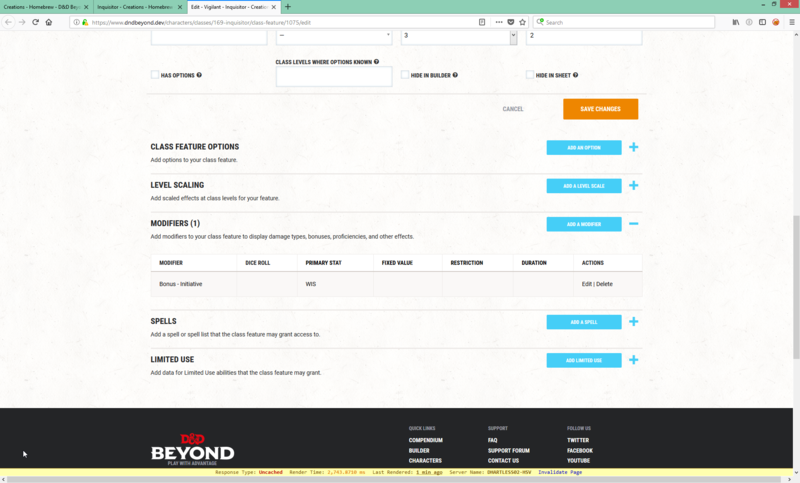 We've also added the Add / Remove Collection button on the bottom of the details pages as well. 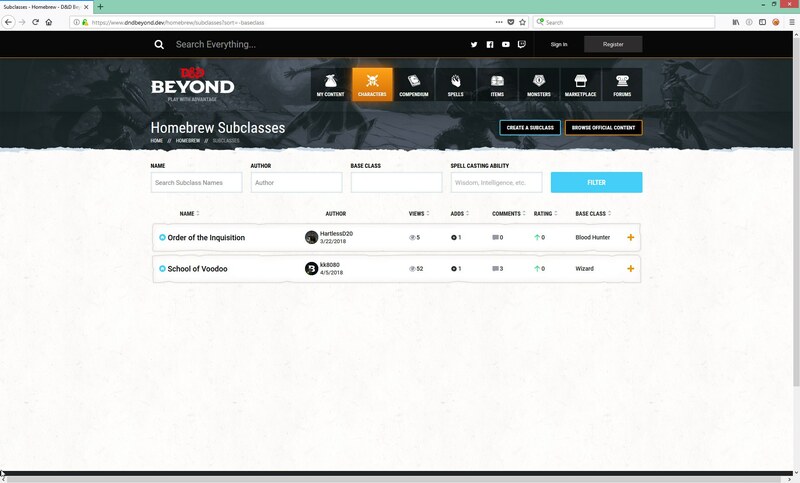 Hopefully, these quality of life improvements to all homebrew will provide for better community engagement and use of all the fabulous homebrew data being created on DDB. If you haven't seen any of James' great in-depth guides on creating various types of homebrew on DDB, please check them out! We're really excited to see all the wonderful subclasses that the community creates! 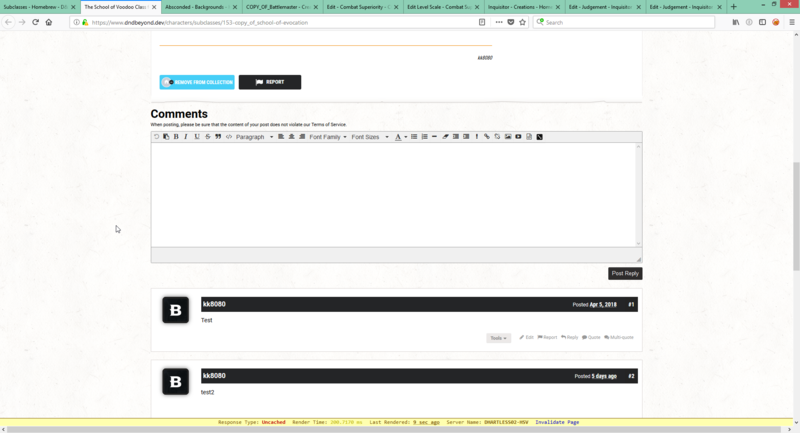 Next up for part of the dev team - source management for content sharing! If you're a mod reading this and I have your attention already, I would also like to know what the rule is on releasing revised versions of existing UA subclasses not currently available on DDB? Specifically, I'm trying to remake the Protection Domain with revisions to the channel divinity feature and list of domain spells. I imagine allowing that kind of content to be shared in the homebrew section risks filling it with tons of identically named subclasses with only vague differences between them and there's also the issue of copyright when some if not most of the subclass is left untouched from its original UA version. Anything that was published under UA is copyrighted and can only be used privately, and would be rejected if you attempted to publish it. At the risk of turning this comment section into customer support, I need to ask if there's a way to create domain spells for the cleric that are always prepared? Even straight up using a copy of an existing domain (Life, in my case) provides no option of altering the domain spells. Also, selecting the copied/homebrew domain in the character builder removes all your auto-prepared spells that you would normally have. You can add domain spells by creating a 1st level feature. (You can name the feature "Domain Spells" or domain name, e.g. "Protection Domain Spells". Add the description of the domain spells : e.g. copy/pasting a table with the chosen spells. Choose display order "1". Then, once you have saved your feature, use the "add spells" option below the feature. Choose "Yes" to the question "Always Prepared?" and specify "Available at Character Level" (1,3,5,7, or 9, for each added spell). Hi to everyone who has been asking about adding spells specific to subclasses! To add to the answer already here, I have just wrote some detailed instructions for a user who has asked a similar question on the forum - apologies that I did not see your posts here first. Check out the post here - and remember that, as opposed to cleric spells in the post I've just linked to, warlock spells DO count as a known spell and are NOT always prepared. EDIT: Some guy called Hartless just updated how subclass spells work, just as I posted this. (I'm not bitter, nope... ;D) Thanks to this amazing change, adding expanded spells is easier than ever - there is a new field called 'Additional Specific Spells' beneath your subclass's description, within its Basic Information. Just don't forget to let your users know what spells you've added there! Let me know if anyone needs help with the new way to add expanded spells. This is due to inconsistencies to how WotC laid out the Cleric domains between earlier books to newer books. We're going to be updating all of them on the site so they are consistent. Is it possible to replace/remove class features using a subclass? My specific goal is to remove the spells granted by the base class and replace them entirely with homebrew spells (which are all just copies of the real spells). 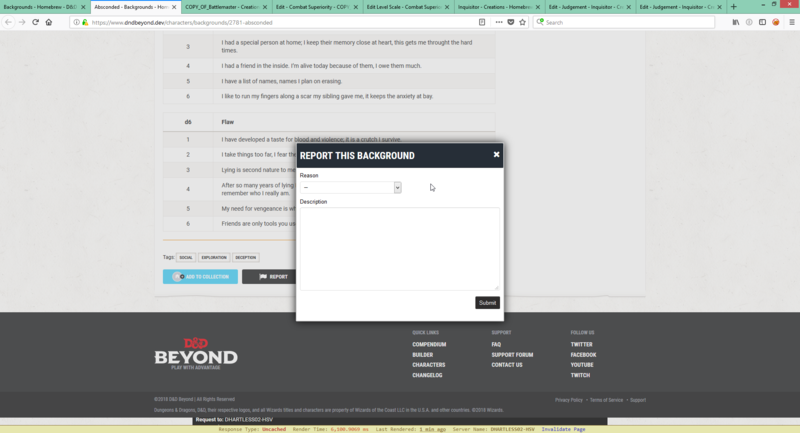 I tried creating an empty feature named "Spellcasting" hoping that it would replace the base class' spellcasting so I could just assign spells to the subclass, but the site just spun forever when I tried assigning the subclass to a character. how do you make this feature work? 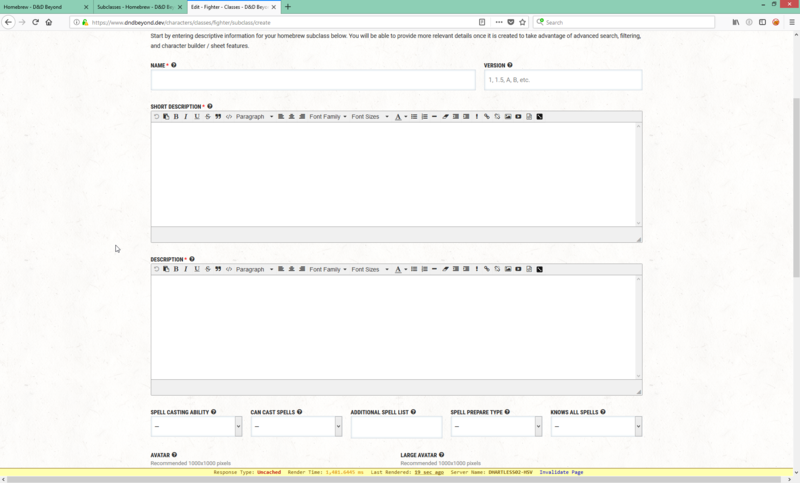 I have added 10 additional spells to my Revised Sorcerer Subclasses (private for copyright reasons) and those spells do not show up on my character sheet. In theory they should be automatically added right? or do I have to set a leveltrigger? For now they are only in the "Additional Specific Spells" editbox. Do I have to write a classfeature for them to work? I'm basically making the Jack of All Trades ability. How do I "Add Half Proficiency Bonus UNLESS already proficient"
Any hope to homebrew CLASSES? The Additional Specific Spells is for expanded spell-lists, which allow characters to choose new spells when leveling up. This is used, for example, in Warlock patrons and Cleric domains. What you are looking for, I believe, is to add certain spells to the Sorcerer subclass automatically. 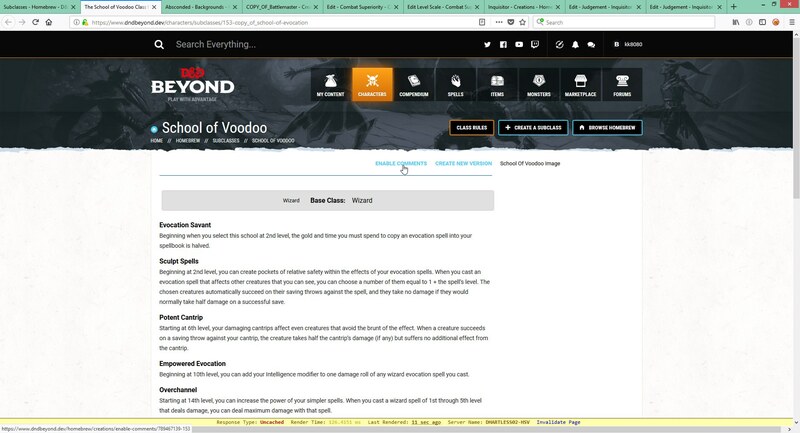 To do that you will be making a class feature for the additional spells, and then adding them via the Spell option within that class feature. I’m very excited about using this feature. It seems like a really cool system. I’m wondering though, if you guys intend on making the option to create a whole new class (not just a subclass) in the future. Or if you plan on including the Artificer class in your Unearthed Arcana content available on DnD Beyond. 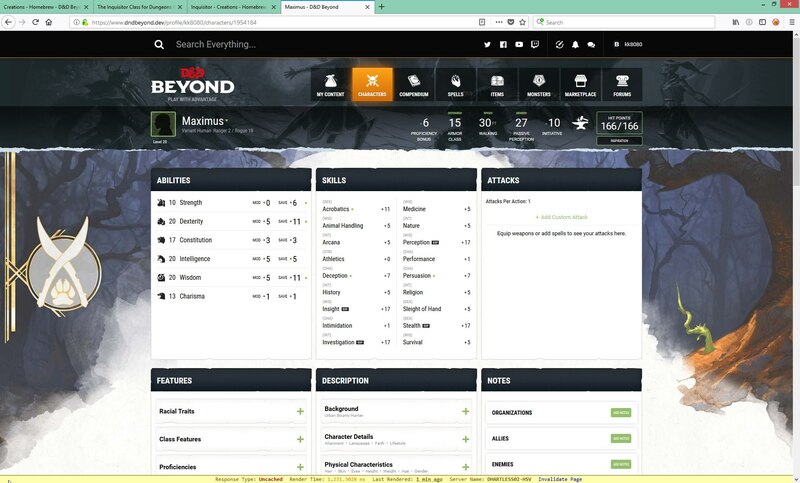 I play a lot of different homebrew classes that are not subclasses, and I also play an Artificer and would love to be able to keep track of my characters on DnD Beyond. In any case, thank you for making this available. It’s super cool. Yes, you will be able to make a full class, this has been announced but not released. This isn't one of their priorities. 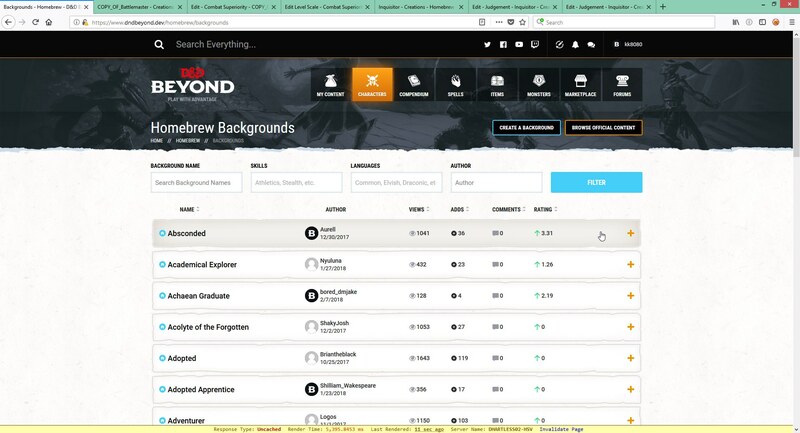 Unearthed Arcana is only on DnDBeyond during the playtest period. After the period closes they remove the content. This is incorrect. They have never said that there will be the ability to create full classes, they have said that it is a possibility, but to not expect it. Hi! 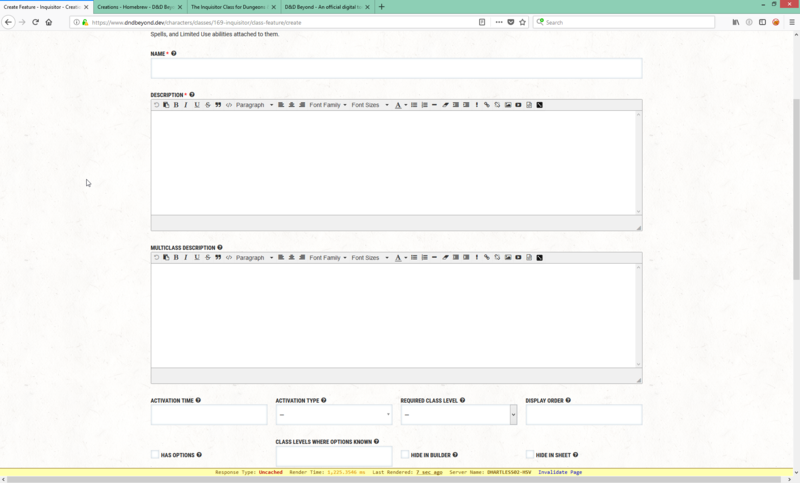 I've created a (wizard spell list) spell casting rogue, with the spellcasting feature. Now when I use the subclass, it won't let me load up the class editor. Any help? I don't believe I saw a similar question to this, but is/will there be a way to create a subclass that doesn't use magic from a class that normally does. For example, create a magic-less ranger? Specifically, I want to make it so that character cannot choose any spells. If this is/won't be possible, then why does it give the option to say no, a certain subclass can't cast spells? I'm wicked bummed that it's so hard to implement custom classes, because this is SO CLOSE but it's not really enough to, for example, implement the Mystic from Unearthed Arcana or the modern / sci fi classes in Ultramodern 5, The 5th Age, Esper Genesis or Hyperlanes. So a lot of the really weird campaigns I'm either in or trying to run can't use the tool. The primary competition this tool has with other similar / unofficial tools is the ability for the GM to do this kind of weird off-book stuff. 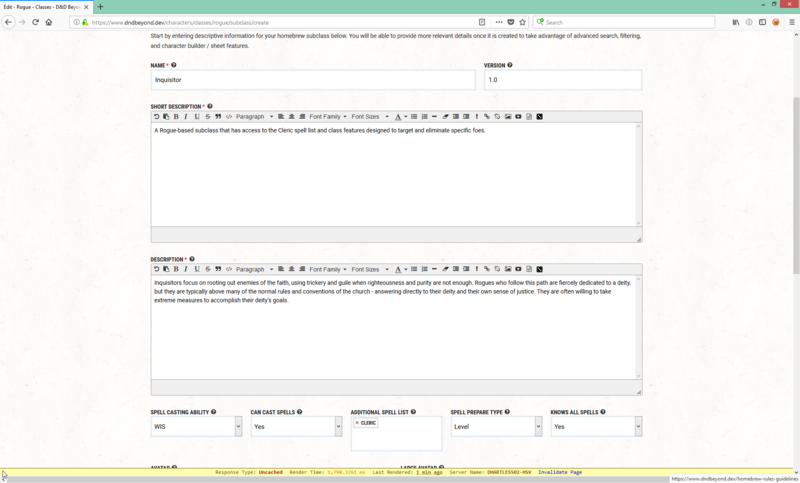 If even one character in the campaign is using a class from a third party source book or from old Unearthed Arcana... there's no way to make that happen in this tool. Anyway, custom subclasses are huge, and you're doing a lot of amazing work and I understand that it's just really a lot of work to go back and make it so a player can build custom classes. This signals that you understand what players want and are working toward it and I love that. It gives me hopes that some day we might see homebrew classes, though that day may be rather far out. I'd love to be using this for all of my campaigns. I am having issue creating class feature options that appear in the dropdown menu in character creation for a subclass I am making. 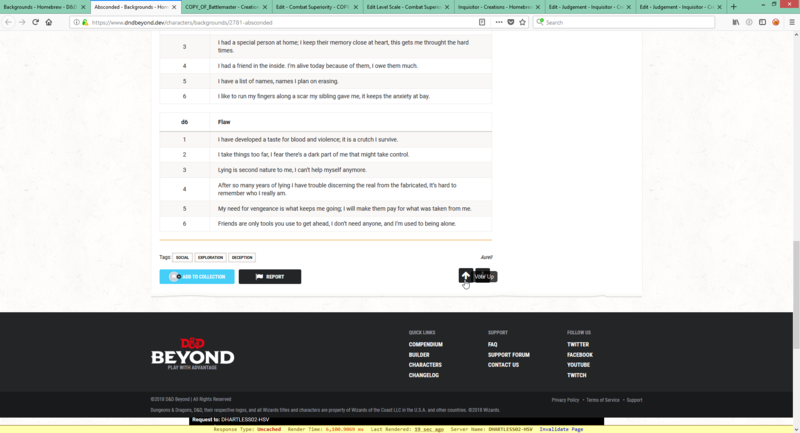 I can create the class feature, and I can change the class feature to have options, and I can type in options for this class feature just fine. 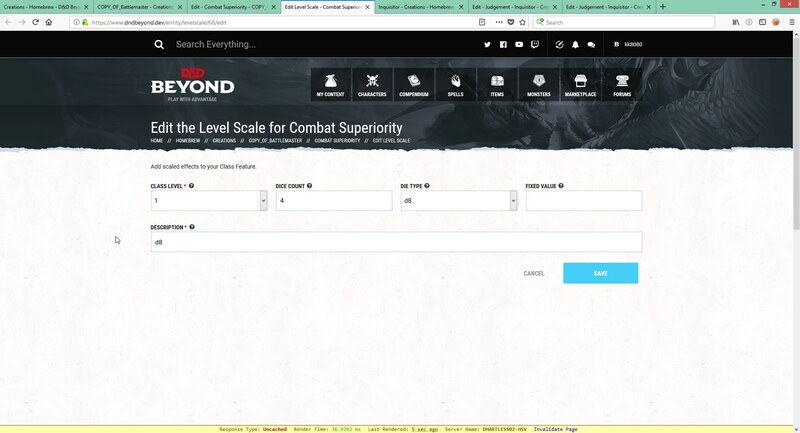 However, when I then go into character creation and pick my Homebrew subclass and click on the "Choose a Level 3 Option" drop down menu, none of my options appear, leaving a blank "Choose a Level 3 Option". I have been at this almost all day, and none of my google searches have yielded any useful information. What am I doing wrong? Is it perhaps a bug? How did you even pick your homebrew subclass? I can't find it during the character creation process.